Northbound waiting room, Pennsylvania Station, Wilmington, Delaware. This remarkable space is part of the 1907 Frank Furness station in the city of Wilmington and is one of two new images included in the Professional Artist members Exhibition. For the second year in a row The Mainline Art Center of Haverford, Pennsylvania selected the Main Line project as one of seven finalists for the 2017 Meyer Family Award for Contemporary Art. The competition featured over 200 applicants, awarding three solo shows to artists representing a diverse base of mediums while honoring an additional seven finalists with Professional Artist programming throughout 2017. For more information on programs and exhibitions at the Mainline Art Center visit their website. Some new work for the Mainline Project was recently included in Alexander Benjamin Craghead's article for Railroad Heritage, the quarterly journal of the Center for Railroad Photography & Art. Image credits, clockwise from the top left; John Sanderson, Stuart Klipper, John Sanderson and Travis Dewitz. Reproduction courtesy of the Center for Railroad Photography & Art. I am honored to be part of a fantastic article written by Alexander Benjamin Craghead for the Center for Railroad Photography and Art's quarterly journal Railroad Heritage. The article delves into the writings and lectures of landscape studies scholar John Brinckerhoff Jackson, exploring how his work has influenced several generations of noted photographers who's imagery focuses on the railroad landscape. 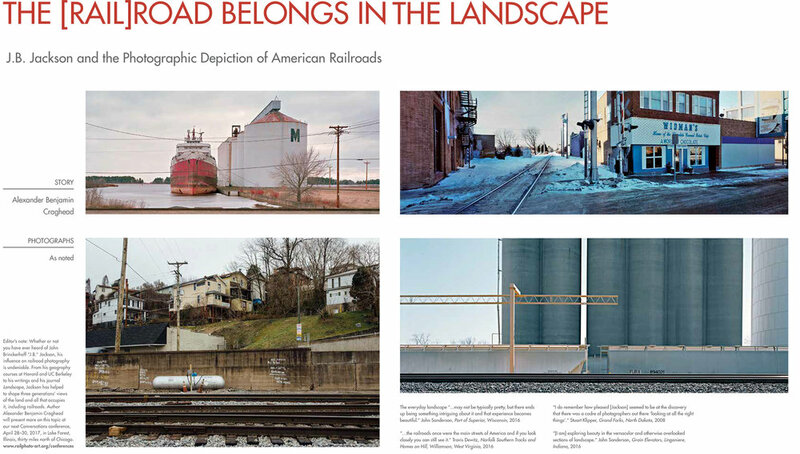 It is a privilege to be featured among several accomplished photographers and peers including Edward Burtynsky, Jeff Brouws, Travis Dewitz and John Sanderson in a thoughtful piece that celebrates work about the railroad but not implicitly the trains themselves. The Center has taken significant initiatives to expand the horizons of both rail enthusiasts, historians and photographers alike while broadening the reach of this genre beyond the average audience. Craghead teaches American Cultural Landscapes at the University of California, Berkeley, a class started by J. B. Jackson many years ago. He'll be presenting more on the subject of Jackson and railroad photography at the Center for Railroad Photography & Art's annual Conference in Lake Forest, IL at the end of April. I’ll be presenting a lecture on my ongoing photographic project, From the Main Line: A Contemporary Survey of the Pennsylvania Railroad for the Philadelphia Chapter of the National Railway Historical Society. Inspired by the work of photographer William H. Rau, who was commissioned in the 1890’s to document the PRR and its destinations, the project explores the transitioning landscape along the former PRR main line from New York to Pittsburgh, highlighting the unique vernacular of facilities and infrastructure built by the PRR. This project combines historical research and original imagery to present a creative documentation of one of the most important railroads in American history. The NRHS was founded in 1935 by a group of rail historians. It has since grown from 40 founding members to include over 13,000 men and women of all ages and professions in every state and many foreign countries, making it the nation’s largest rail preservation and historical society. The Philadelphia Chapter, established in 1936 is one of the founding chapters and has been instrumental in preserving the local railway scene. The lecture, on Friday, February 17th, 2017, is part of the Philadelphia Chapter’s monthly meeting. The program is free and open to the public and will begin at 7:30 PM in 121 Randell Hall, Drexel University, 3141 Chestnut Street, Philadelphia. More information to follow as the date approaches.